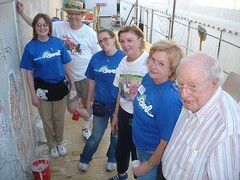 "It was twenty years ago that we began to sponsor the tile projects at the Revel," said artist Jerry Wray at Revel 32. Mosaic designs supported by the Wrays have been cemented to many walls in the ensuing years. Typically the family jumps in to participate in the creation of the tile work. 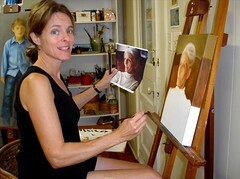 Wray's daughter, Mary Virginia Hill (above) is a painter. Granddaughter Katie Galloway (also above) is also an artist. 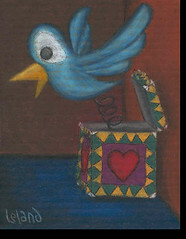 A student at Louisiana Tech, her art has been in several Tech exhibits. Wray's daughters Deanie Galloway and Nancy Amistead have also shown art, as have several additional grandchildren. Some of the Revel's mosaic projects have disappeared owing to expansion by the casinos and the Red River Waterway Museum. Wray is philosophical about the changes. Her outpouring of art over a six-decade career has won Wray a place in six museums. The artist, a sculptor as well as painter, will talk about her life in art at Bossier Arts Council Fri, Oct 5. 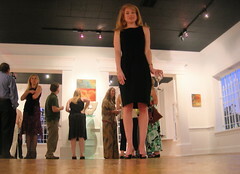 Her talk and slide show will reflect art over the long haul as well as offer an overview of trends in US art. The lecture and Q and A, part of a series sponsored by West Edge Artist Co-op, will begin at 6:30, says Danielle Reans. 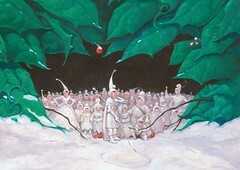 Enjoy Wray's painting and sculpture at jerrywray.com. Revel perennials performing throughout the week include Grammy Award-nominee Trout Fishing In America and zydeco lion Terrance Simien, of Plaisance, La. Both are highly recommendable and are long-time faves of mine. Trudeau's escutcheon is bestowed upon . . . The act of seeing and drawing what you see is the theme of a twelve-week adult drawing course at Barnwell Art Center, says Freda Powell. The class, aimed at beginners, will be presented Thursdays from 6 pm - 8pm, October 18 to January 10. Participants will gain a working knowledge of the practical, formal and theoretical aspects of drawing from life, says instructor Don Alexander. He is a retired professor of fine art at Louisiana State University in Shreveport and former professor of fine art at Northwestern State University. How to draw complex shapes, how to use realistic light and shadow, and how to apply proportion and perspective to create compositions are among his goals. Space is limited. A one-night performance of the Best Little Whorehouse in Texas will take place at Fox Creek Farms on Sat, Oct 20, at 7 p.m. The evening, a fund raiser for River City Rep - Patric McWilliams, et al - is to be a relaxed affair which will feature drinks and a BBQ meal prior to the performance. McWilliams says, "Join us as River City Rep moves into its second season. Enjoy BBQ and drinks and don’t miss your chance to catch up with Miss Mona and her girls as they serve up good music and dance." Ticket includes Performance, BBQ, beer, wine and soft drinks and valet parking. Wynton Marsalis tunes dominate soundtrack for Ken Burns documentary on WW II, The War; series resumes Sun. Tunes by Wynton Marsalis dominate the soundtrack for The War, a seven-part documentary directed and produced by Ken Burns and Lynn Novick. 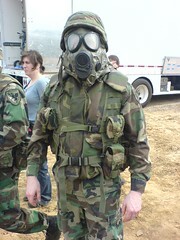 The film explores the history and horror of the Second World War from an American perspective. It follows ordinary men and women caught in one of the worst cataclysms in human history, says Burns at wyntonmarsalis.org. Wynton recorded his tunes - Burns calls it a "massive suite" - with musicians Victor Goines, Walter Blanding, Jr., Carlos Henriques, Ali Jackson, Mark O’Connor, Bill Charlap, and slide guitarist Doug Wamble. The score is evocative, bluesy and jazzy and often spooky. 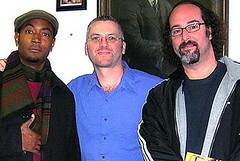 Link to a video clip from the recording session, with Wynton and Ken Burns, at Wynton's site. Other clips from the film are available on the PBS web-site. Join Susan Hymel, LANO, in a Mini Workshop – The Funding Pie: Recipes for Developing Sustainable and Diversified Revenue on Thursday, October 4th @ 1:00 p.m. – 4:30 p.m. "You will leave with knowledge, a smile and full of pie!" says Ann Sirmons. Hymel reminds the arts-minded that "Funding security for all nonprofit organizations usually depends on having multiple sources of revenue. Using the analogy of a pie with multiple slices, this training explores ways of planning, executing, and evaluating the different ways of raising funds in nonprofit organizations." Attendance at arts events in Shreveport-Bossier is reasonably good, I'd argue, but tickets sales do not - by themselves - support the lovely level of artistic production in this area. That's one of the reasons that LANO North is such an important resource center. See a message from the former Shreveporter who is president of LANO, Melissa Flournoy, at Lano.org. William Joyce created SnowBodies for the LSU Health Sciences Foundation’s 10th Anniversary Holiday Cards, says Kristen A Gary. 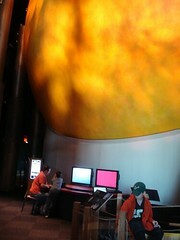 Revelers: Get starry-eyed at Sci-Port the first night of the Revel. Bring in a hole-punched Revel ticket and enjoy the festivities for just $3. In September, the constellation Andromeda rises. Within it is our closest galactic neighbor, the Andromeda Galaxy! You may want to arrive early to find parking. The event will proceed even if there is bad weather. Centenary College’s Marjorie Lyons Playhouse presents Eric Overmeyer’s On the Verge, or the Geography of Yearning, directed by Emily Heugatter-Mathias. The cast includes Kalah Roberts, Rachael Lee Magill, Savannah Baggerly and introduces Scott Gibbs, says MLP's Carrie Rowlett. Three Victorian women from 1888 enter into the strange and enticing world of Terra Incognita. What begins as a simple trek through the wilderness becomes an adventure through time. 1955 is the ladies’ destination. The need for adventure and intrigue are quenched in this journey of discovery. As the new Assistant Professor of Theatre at Marjorie Lyons Playhouse, this production is Emily Heugatter-Mathias’ directorial debut. Box office open daily between 12 and 4 pm: 869-5242. 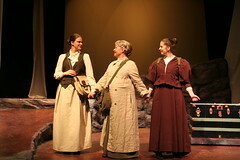 Photo is from a production of On the Verge at Park Univ Theater. George Clinton, The King of Interplanetary Funkmanship and Atomic Dog Number One, was the monstermaster of the bands Parliament and Funkadelic during the 1970s and early 1980s, says Wikiepdia.org. In addition to bass and drums, his sense of the absurd is what it's all about. The Red River Revel, in a moment of revolutionary irreverence, has booked the living legend. The Mothership is scheduled to land Oct 6, on the ElDorado RiverView Stage, 7:30 p.m.
Alongside James Brown, George Clinton is considered to be one of the most sampled musicians ever. He has appeared in movies, produced the RHCP's Freaky Styley album, and, in an ultimate accolade, appeared as the voice of The Funktipus, the DJ of the Funk radio station Bounce FM in the 2004 video game, Grand Theft Auto: San Andreas, in which his song Loopzilla also appeared. Has the Funkenstein slacked lately? Don't think so. A 2005 album was entitled How Late Do U Have 2BB4UR Absent? Not that you'd care about anything else on the Revel schedule after learning of the funkence of Mister Maggot Brain himself, but here's the schedule. Artist Rodrecas “Drék” (pronounced Dreek) Davis’ introduction to the Grambling State University community will take place in the Dunbar Hall Art Gallery in a Sept show, says Davis. A new faculty member in the Art Department, Davis will be presenting an exhibition of his mixed media and assemblage works that deal with the intersection of pop culture, history, politics, and religion. 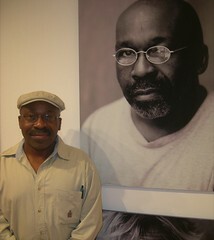 Davis is a 2006 graduate of the University of Georgia Fine Arts program - with an emphasis in drawing and painting. Mr. Davis sometimes pulls from his journalism and musical experience as a compliment to his visual artwork. …and a few words will be on display from September 17- October 4 in the Dunbar Hall Art Gallery. 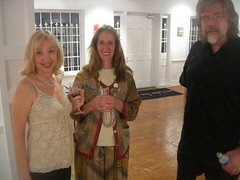 Reception: Tues, Sept 25, from 4 - 6 pm. It has been a while since an artist has landed on the sptBog digital doorstep as has Drek. Full range of online photos of his work, wicked sense of humor (see above and the art on that flickr site), adept at communications - he wrote for AthensOnLine - musician and future curator. 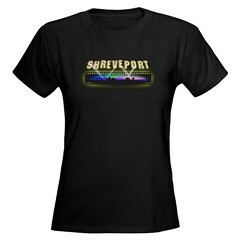 And aware that Shreveport needs to communicate with Grambling. Bookseller and reviewer Michael Parker wrote recently, "Tentatively planned for Sunday evening, Nov 4, is a reading of classic poems and prose works of the Beat era, read by local and regional writers, artists, and interested fans. 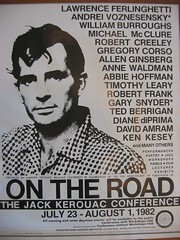 The idea is that each participant will take one writer from the Beat Generation orbit and read a selection of works. Poet/scholar Charles Stein will be at Centenary College on Thursday, November 1, followed by a performance/reading the next evening. During the weekend, still being planned, will be a film festival celebrating the Beat Generation and related artistic movements. The reading will take place Sat evening. I would like to have a wide selection beyond the usual Beat trinity of Kerouac, Ginsberg and Burroughs. If anyone would like to make other suggestions (including the wide variety of female and non-white writers), please let me know. 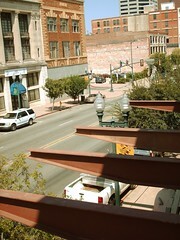 Says the Robinson's leg man, Chris Jay, "Noticed those giant, steel spikes looming over Texas Street? Those are the first signs of our balcony's installation. You can see the balcony as it is planned in many of our architectural renderings." Additionally, at the RFC flickr.com site, you'll see a tight photo essay on the latest construction and what it all means. Such as "The Celebrity Theater is coming along very quickly. Even the front row viewers won't feel squashed up against the screen or forced to strain their necks. Wider-than-average seats and aisles with more legroom are added perks." The Robinson Film Center has a French biography, en Francais, for one night only. It is La Vie En Rose, the well-mentioned life of singer Edith Piaf. Catch it, literally, Thurs, Sept 27, 7 pm, at the Regal Cinemas Louisiana Boardwalk. Admission is $7.50. This story (I refuse to print the term biopic) of the iconic French performer follows her life from teenage street performer to international superstar, highlighting her loves and struggles along the way. Says Chris Jay, "We booked the film because of the near-deafening buzz about the lead actress’ performance as Piaf, and to test out Shreveport-Bossier City residents’ receptiveness to foreign-language fare (the film will be presented in French with English subtitles). The local reaction has been pleasantly surprising, as we have sold about 150 of the 300 tickets available." 12:00 Lotus Studio. 444 Olive St.
- yoga class and meditation with Heather Provenza. 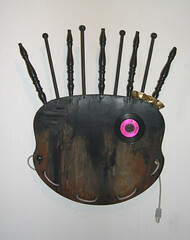 - artists document the vent. 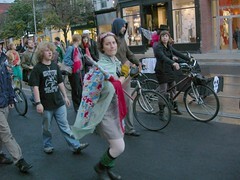 1:30 procession to Columbia Cafe by foot and bicycle. 2:00 Columbia Cafe, 3030 Creswell Ave.
group Lotus Dance lead by Lotus Studio and Port Belly Project. Spontaneous laughing yoga and drumming may occur between acts! 3:30 - 6:00 Video documentaries presented by Robert Trudeau. 3:00 - 6:00 white origami crane making. Peace Cranes to be sent to the UN. Luminaria making. Luminaria to be setup for closing ceremony. The Highland Spirit House Project is a community-based arts project coordinated by Meadows Museum of Art at Centenary College of LA, says Leia Lewis. The project brings people together to share stories and create a work of art about the history, daily life, and dreams of the Highland community. The invitation from Leia Lewis says, "Please attend a community story circle on Fri, Sept 21. It's at Meadows Museum, 2911 Centenary Blvd, 5:15 to 7:30 pm. Everyone is welcome - families, schools, churches, merchants. Every September 22, people across the globe get together to swear off their cars - if only for one day - in a collective reminder that we don't have to accept car-dominated societies, cities, or personal lives. Says adbusters.org, "Since its earliest incarnations in the 1970s and 80s, World Carfree Day has grown into a massive global celebration of human-centric communities and people-powered transportation." Concerts by the Baroque Artists of Shreveport bring a touch of Europe to this region. St Mark's Cathedral is grand and historic enough in style to evoke the original sites and performances. The musicians are top drawer. Sun at 3 pm the season's first concert by the Baroque Artists presents the music of Loeillet, Telemann, Handel and Vivaldi. A consumer's note: I prefer to be as close to the front as possible in order to minimize the stone hall's reverberation. If you sit in the middle you may find a considerable sustain of the notes played by the ensemble. That may be agreeable to you. Or not. St Mark's; corner of King's Hwy and Fairfield Ave.
Stacy Brown, SBC&TB president, and Pat Gill, web master, delivered a remixed, refreshed web site to the public last month. A web site design make-over is not easy to craft but they are very important to the region. The public can somehow smell a dated design. The tourism site is colorful and throws out a jazzy vibe. The bureau clearly wants to be as ebullient and helpful as possible. Pages are filled with both images and copy. The tourism group's email newsletters and web re-do are part of an updated package that I think is terrifically helpful to the area. Pursuing a link to test the new site I found the Strand Theater site and another re-do. The previous Strand site was dated and lacked the sense of style that the building portrays. The new site is gorgeous. It has an exemplary blend of space and copy and image. The colors and textures seem to reflect the sensuous appeal of the historic theater. Photo above: Paul J Whaley, a photog whose images on flickr.com are consistently impressive. Two years ago the New York Times began charging for access to its archives. Today it declared an end to the program. "What changed, The Times said, was that many more readers started coming to the site from search engines and links on other sites instead of coming directly to NYtimes.com. These indirect readers, unable to get access to articles behind the pay wall and less likely to pay subscription fees than the more loyal direct users, were seen as opportunities for more page views and increased advertising revenue. “What wasn’t anticipated was the explosion in how much of our traffic would be generated by Google, by Yahoo and some others,” Ms. Schiller said." How long until Gannett, parent company to the Shreveport Times, will emulate this policy? Broadmoor Library: 2 - 4p.m. Dr. Cheryl White of LSUS History Dept. will review and discuss the book,"Kingfish: The Reign of Huey P. Long." The public is invited. KSLA News early morning interview discussing upcoming events. Main Library: 12 noon Brown Bag Lunch. The book will be reviewed and discussed. The public is invited to bring their lunch and participate. Review by Peggy Evans, Collection Development Dept., Shreve Memorial Library. grade students on the topic of government and Louisiana. discussion of events for One Book One City. author of "Kingfish," will speak. The public is invited. Woodlawn Ave. and adjacent streets. be guests along with the interested public for this 60 minute film. "This week's out-of-state guest artist, Zarco Guerrero, from Mesa, Arizona, will be performing a one man masked drama performance on Friday at 7pm at Artspace," says Bonne' Summers. Guerrero will also teach a mask making workshop on Saturday from 11:30 to 1:30 ($35) which includes creating your own mask and taking it home. At zarkmask.com we see, "Renowned sculptor/mask maker Zarco Guerrero reveals the awesome power of the mask to transform in this unique one man performance. With a master's touch, the artist personifies eccentric prototypes forcing us to examine our most innate feelings and thoughts on such themes as self-esteem, bigotry, aging, abuse and denial. Zarco, who has traveled extensively investigating the use of the mask in theater, ritual and ceremony, brings years of first hand experience to life in this chilling yet comical presentation. Through the artist's eyes we see ourselves and society as never before - exposed by his masks, movement and monologue." "She's great, but no one in Shreveport has heard of her," admits Bruce Flett about Charlottesville, Va, singer Robin Wynn. "She's popular up and down the East coast." Wynn, who bears comparisons to Bonnie Raitt and Lucinda Williams, will hit Shreveport with her 6-piece band Fri and Sat, Sept 21 and 22. 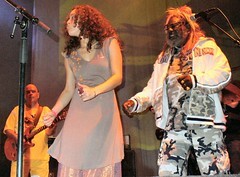 Her shows will take place on the edge of Cross lake at Jayne Marie (please see sptBlog links). The music's original but easy to follow, as one will see at Robin's myspace site. There's also the sweet www.robinwynn.com. 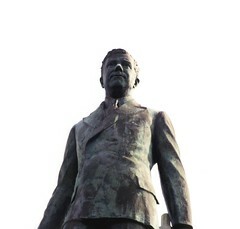 In Gentilly, New Orleans, the late artist John T Scott gathered images of the city from neighborhood people and built a monument to their lives. He called it Spirit House. Scott's monument is an annotated shell of a shotgun house that is elevated above a park on DeSaix Blvd (Fairgrounds neighborhood). It survived the flood that followed Katrina. In Shreveport, Leia Lewis, education director for Meadows Museum of Art, Centenary College, has a vision of a companion monument. To be called Highland Spirit House, the project has become a class taught by Lewis at the college. She is approaching it as an outreach to the neighborhood. 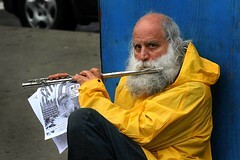 Mat Schwarzman is a specialist in community-based art projects. He has written a book upon the topic and has a PhD in Transformative Learning & Change in Human Systems from the California Institute of Integral Studies. " He has helped establish arts education programs for teens, college students and adults across the United States," notes Lewis. No one knows quite what the Highland Spirit House might be, but there's a hint in an evocative exhibit of works by John T Scott on display at Meadows. I recommend it highly as art and a start toward imagining Shreveport's project. Docent training on "Community-Based Arts Projects and Process"
Centenary College Convocation on "Transformative Learning, Diversity, and Change through the Arts"
From my front row vantage at the Shreveport Symphony Orchestra's opening concert concert Sat night, I could see a concert hall filled to the highest bank of seats in the balcony. On the stage, Michael Butterman trippingly told stories about the composers and pieces to be heard. 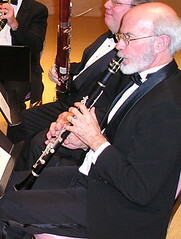 The musicians, some 40 of them, played with discipline. It was reassuring to see that 60 years after its founding, the SSO remains a community magnet. To mark this anniversary the founding conductor, Maestro John Schenaut, was guest conductor for the Star Spangled Banner. Though confined to a wheel chair, Schenaut visibly enjoyed the moment. The audience seemed to reciprocate. Pianist Yoonjung Han, a Korean lass of 22 years, played the Liszt Piano Concerto No 1 with graceful hands and passionate body English. Since we sat on the keyboard side of the hall, we could see the tiny performer's hands grow into spidery bridges, arcing across octaves. 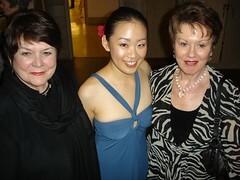 At evening's end the audience congratulated the musicians and Butterman and itself via sustained applause. And the Maestro was ready for it. With graceful bearing and cogent timing he closed the evening with a quiet 20th century piece, Ravel's Pavanne. Call the SSO ticket line, 227-8863 (227-TUNE). On concert day - noon through the concert's intermission - there will be a phone link that rings the Riverview Theater box office (673-5108). But there's only one line at the Riverview Theater. If someone's on the line purchasing tickets, the phone line may ring and ring. Do not despair. Call back in a few minutes, says volunteer Deborah Scarlatto. Buy Anytime Tickets for Flexibility. Don't put off buying your Symphony tickets because of scheduling difficulty. Our Anytime Ticket Package provides you with six vouchers you can redeem for tickets to any concert except special events concerts. You can use all the vouchers at once, or spread them out over several concerts. To redeem them for tickets, just call in advance. We'll reserve the best seats available. Cost for the six-vouchers Anytime Tickets Package is $192. You get all the privileges of a season subscriber plus up to 20% off the cost of single tickets. 7:30 pm is the usual start time for concerts presented by the SSO. 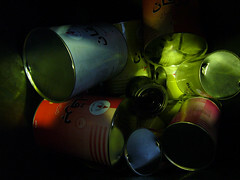 Aerosol cans, auto products, batteries, cleaning solvent, paint thinner, turpentine, paint, stain, varnish, shellac and tires. And quite a bit more, but you get the idea. What's not acceptable? Explosives, radioactive devices (smokefire detectors), gas cylinders, fire extinguishers, styrofoam peanuts, televisions, appliances. 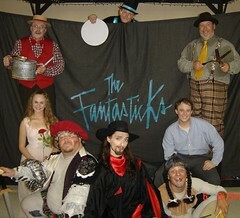 The Fantasticks, directed by Paul Moore for the Gilbert & Sullivan Society, has gotten terrific reviews. If you'd like to see it this weekend, please note that the show is on the road. 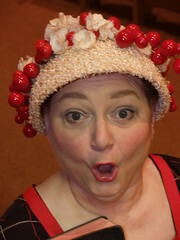 The fun is at BackAlley Community Theatre, Grand Cane, on Fri and Sat, Sept. 14 & 15. Your death? The colorful version of it? 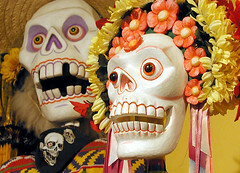 Borrowing from the Aztec and Mestizos landscape the Mexicans dance upon the interred bones of the departed. We're talking about the superbly therapeutic Dia de los Muertos. 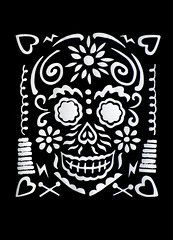 Papel Picado workshop with artist Kathleen Trenchard from San Antonio. Create, cut and take home a gorgeous intricate tissue paper design! $35 per person. Includes all supplies and materials! 2 day workshop with Papier Mâché artist Pilar Castrejon. 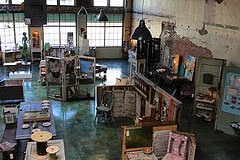 Workshop fees include all supplies and materials @ $35 per person. and take one mask! All supplies and materials included in workshop fee, $25 per person. 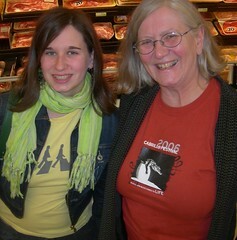 Sandra McWherter says check out the “What’s Hot” section of www.shrevearts.org. 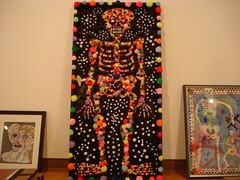 Also, visit Artspace to get a whiff of how colorful death can be. Big dead party Friday, Sept 14, 5:30 to 8 pm. Take your parking ticket with you to the party and it will be validated, says a helpful reminder from Byron Gates, Jr.
Open to all art/party lovers, no invitation required to get in. Fresh from appearances at the T-Bone Walker ("Stormy Monday") Blues Fest, Bruce Flett says, "Thurs, Sept 13, The Bluebirds open for Nicole Atkins at Jayne Marie on Cross Lake, starting at 6:30pm." Continues music-wise Flett: "Rolling Stone named Nicole as one of 10 Artists to Watch. She and her terrific band, The Sea, will be at Jayne Marie's Thurs as well as Fri." Flett reminds that Jayne Marie's, the former Smith's Cross lake Inn, has "an intimate, beautiful setting upstairs overlooking Cross Lake. There's no cover charge, but tables reserved for dining customers." This is the way a city should function at its ideal: big, established emporium, Artspace, does a big-budget celebration of Dia de los Muertos. Small bar that caters to 20somethings, Jackrabbit Lounge (formerly Joe's), offers space for developing artists to create their version of Dia. The Artspace blowout - enough color on the walls to supply a herd of finger-painting elephants - opens Fri, Sept 15, at 5 pm. The Dia show at Jackrabbit Lounge - once a rockers' dungeon that has been transformed into an uptown art lounge by Jen Wasson and a team of artists (more on that story soon) - will not open until Nov 2, the actual date of Dia. Conchita Iglesias-McElwee is the spirit with a foot in each cemetary. While she's helping Artspace ("You really ought to consider getting yourself a Myspace page, for starters.") 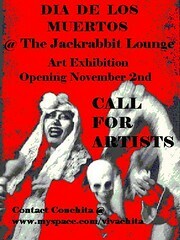 she's also able to meet the needs of her gang by curating the show at Jackrabbit. "More than 10,000 students from across Louisiana are already scheduled to tour the Faces of Katrina exhibit" when it opens in Baton Rouge, says Pam Atchison, director of Shreveport Regional Arts Council. Bill Joyce and Pam Atchison are planning the installation of the giant photos and boards filled with text that were displayed initially in the Artspace exhibit in Shreveport. Faces of Katrina will open October 1 at the Capital Visitor's Center, Baton Rouge, according to Atchison. The black and white exhibit, which drew some 5000 visitors to Artspace, Shreveport, is based on the work of photographers Stan Carpenter, Katherine Gaiennie, Talbot Hopkins, and Mike Silva, as well as Lafayette photographer Philip Gould. "This Saturday, we're having an art show at Prima Tazza featuring the works of the instructors with the Talented Arts Program (TAP)," says artist and teacher Thomas Little. The show's already up and will be until the end of this month. "No one captures the feeling of the west like Chuck Pyle" says a reviewer for acousticmusic.com. " Not the vulgar defiant individualist who struts around sticking his low social grace in your face, but the quiet introspective lover of the land; all its textures and creatures. His stuff is completely relaxing. "Endless Sky" is is the third release by the singer-songwriter from Colorado, the first two being "Step by Step" and "Drifter's Wind." 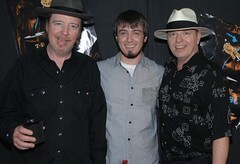 Pyle spent several years writing country music in Nashville for among others Jerry Jeff Walker. Today, he writes songs, gives workshops, and tours; preferring to create music that is less commercial and truer to himself." In addition, monsieur Pyle has a beautiful web site. Sponsors: Bossier Arts Council & Red River Radio. Chef Aleks Martin inquires about the folk foods of North Louisiana: "We need to preserve what we can." Writes former Shreveporter Aleks Martin, "I'm trying to find information about Poke (also Polk) salad (also sallet or salit [according to that nefarious wikipedia]) indigenous to NoLa and the Dirty South; especially in reference to Blanchard and its Polk Salad Festival. Over the years, I have lived in NOLA and traveled elsewhere but found my calling as a chef, or at least a safe keeper of taste, in th 504 area. There is a real drive for preservation of the culture once known as not just Creole, but Louisiana as a whole in the coastal area. Please don't think me silly, but I know I need to introduce and reintroduce my peers to the flavors of North East Texas and the rest of the Eastern South (as so much as I grew up with it in the crossroads that is Shreveport) to these flavors to truly define the future of what we are calling "Contemporary Creole Cuisine". Vacant celebrities like Emeril Lagasse and Anthony Bourdain can not and will not define the flavor profiles of my children and subsequent generations if there is a cohesive drive to understand and appreciate our flavorful heritage dating back before even the great Escoffier came into prominence. I will end this rantish email just by asking you to pose a few questions to your class, especially those from even farther in Caddo Parish, to define their flavors and maybe give me your thoughts? In a world lacking of thought, we need to preserve what we can." As you can see, Martin has a restless intelligence, deep curiosity and a sense of overarching the crap. I'm going to point him toward folklorist Susan Roach-Langford's writing on foodways in N La and would like to get a copy of Goodloe Stuck's Heritage Scrapbook of Northwest Louisiana. If you have an extra copy of Stuck's book - he also wrote the Annie McCune story in a book called Shreveport Madam - please email me. ArtPort 2007, says Lewis Kalmbach, opens Thurs, Sept 13, with what promises to be a gatagious get-together in the lobby and hallways of the Shreveport Regional Airport. Dancing by the Dirtfoot dancers. Here's a video invitation by Kalmbach, the event's founder and navigator. Photographer Phil Messinger has worked as a location scout for movie production companies and in general has taken the measure of S-B and the Hollywood South business. 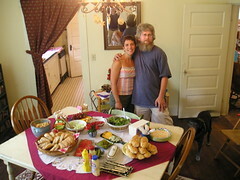 His response is to cook up a few products to celebrate "Shreveport and Bossier City, Louisiana; where celebrities and the undiscovered mingle, enjoying the happy, simple pleasures and laid-back living; away from the sprawling, congested concrete of the east or west coast." Messinger's Municipal Auditorium is my favorite. What's yours? 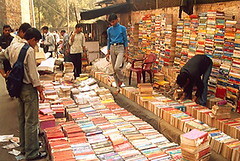 Centenary Book Bazaar will be the largest yet, says Jennifer Strange. Doors at the Gold Dome will remain open . . .
8 a.m. to 3 p.m. Sat, Sept 8. Admission is free and book prices start at 25 piastres. books, music in CDs, DVDs, VHS tapes, cassettes (which is making a comeback, I've read) and, whoa, LPs. On Saturday, all items are half-priced after 1 p.m. The sponsoring Centenary Muses are women committed to philanthropic support of Centenary College students. Sunni Mercer's distilled landscapes are far from the entire story on this Oklahoma artist. Fresh paintings from Mercer can be viewed in the Amy Baber Fine Art gallery at 6505 Line Ave, suite 2 of Pierremont Common. But there is a world of art that precedes the stark, intriguing trees at Baber. Ms. Mercer served as the Director of the Oklahoma City National Memorial Center, overseeing the design phase of the museum. She is an NEA Regional Fellow. Her work is archived at the Smithsonian Institution and she is certified with the National Parks Service in Interpretive Planning. Baber and gallery partner Carl Bearden continue to demonstrate a rarified sensibility in the art that they present. 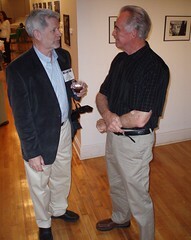 They handle a few artists who reside in the area, such as Michael G Moore, Bill Gingles, Rachel Stuart-Haas, D. Brian Dooley and Carl Bearden. The remainder of their artists are from the wide blue. 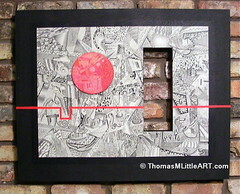 The contrast and flow of the art presented is a study in taste and packaging. The Mercer paintings will be up from Sept 8 to Oct 6. Reception Sat, Sept 15, 6 to 8 pm. "Each month we spend an evening highlighting artists of various professions in our arts community," says Danielle Reans of the West Edge Artists' Co-op. "This Friday at 6:30 pm we’re honored to bring you our next installment with the talented Bill Gingles." "There will be time to mingle as well as a formal presentation by Bill showcasing his work. His talk will be followed by questions and answers. We're honored to collaborate with the Bossier Arts Council and are thrilled to hold the event in their space at 630 Barksdale Blvd." Shreveport Little Theatre’s box office will open Sept 4 for Smoke on the Mountain Homecoming, a bluegrass musical appropriate for the family, says Robert Darrow. It will be staged Sept 13, 14, 15 at 8 p.m., with matinees on September 15 and 16 at 2 p.m. at the University Center Theater at LSUS. It is part three of a trilogy that follows Smoke on the Mountain and Sanders Family Christmas. The first two productions of the trilogy broke all box office records for the Shreveport Little Theatre. Returning Sanders family cast members include Bill Conly, Bonnie Bailey, Kevin Teague, Kim A. Price, Bonnie Beth Bailey, Charles Stewart, Betty Baker, Warren Grafton, and Rachael Munro. New cast members include Michael Blake Powell, as the preacher, and Mandy Perdue, Carolyn Bryant, Shae Carson, Wyatt Carson, and Bob Bailey. Robert Darrow directs. D.J. 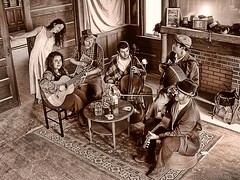 Harman returns as musical director with Cliff and Joycie Yount’s Bluegrass Strings band, including Gene Aultman, Zane Jackson, Ron Williams, and Warren Grafton. Others in the production crew include, Mandy Perdue, stage manager, Debbie Hicks, set design and painting, and David White, lighting design. Box office: noon to 4:00 pm; 424-4439. Shreveport Little Theater is casting its production of Cat on a Hot Tin Roof by Tennessee Williams, says Robert Darrow. Jared Watson will direct and Alexandra Seal will serve as casting director. 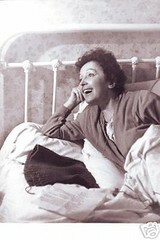 'Cat' was the recipient of the 1955 Pulitzer Prize for Drama. The director is seeking highly experienced actors: 5 men, 3 women, & 5 children between the ages of 8 and 12. Also seeking individuals to play housemaids or servants. All roles are open. Auditions: Shreveport Little Theater, 812 Margaret Place, on Sept 22, 2 p.m. for children and 3 p.m. for adults. Actors will be asked to read from the script. Sides will be provided. 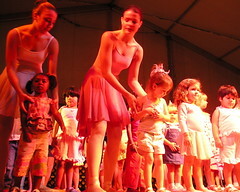 Rehearsals will be weekdays from 7 - 10 p.m. and Saturday from noon – 4 p.m. beginning December 2, 2007. The show will be staged on January 10, 11, & 12, 2008. Anyone wishing to be considered should bring a complete listing of conflicts during the rehearsal period and, if available, a resume and headshot. The director asks that you audition only if you have open availability and can fully commit to attending all scheduled rehearsals. Visitors to Artspace beginning Fri, Sept 14, will be handed a bubbly gulp of color and Mexican taste equivalent to a cerveza in visual art. Upstairs and downstairs the fiesta known as Dia de los Muertos, Day of the Dead, will spew flowers and skulls, says Pam Atchison of Shreveport Regional Arts Council. The Mexicans have a beguiling way of dealing with death. Once a year they drink, smoke and dance with the dead - often in cemeteries. While offering a shock to WASP culture, Dia de los Muertos is more complex than a simple description allows. SRAC's task will be to educate while it entertains and stimulates. 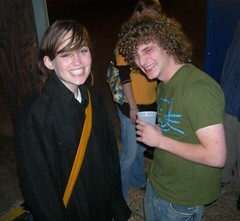 At myspace.com/intenseentertainment we found "New rock club coming to Shreveport! Booking now. It's a 400-capacity live music/dance/sports club in downtown Shreveport at 630 Commerce St.
We are working to revitalize downtown and your support is appreciated! The format: Thursday nights are KTUX 99X's Homegrown Live featuring bands played on Homegrown. 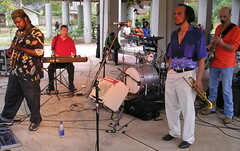 Fridays - National and the region's best original bands. Saturdays -College rock style cover bands and tribute acts (like Motley Crued). Also part of the message at Intense Entertainment was "I'm sad to say that after ten years, Flannagan's is now closed. Ever seen the movie, "the Money Pit?" We put a lot of blood, sweat, and tears into this club and hate to see it go. However, it was not due to a lack of local support. Thank you all! Stay tuned for exciting new developments." Indeed, the myspace.com/flanaganspub says simply, "We are closed." Though the calendar was booked for a month. Hard Rock groups Red (Nashville), Machina (Little Rock), Junior (Gladewater, TX), and Moria Red (Shreveport) will be performing at the opening weekend of the Warehouse. Dirtfoot and Nothingmore. This show is 21-and-up. Porcelain Arms and the Crisis. 21-and-up. Reflections Burn and Sunset Veil. Intense Entertainment is also managing bands such as The American Tragedy and Crackfight as well as producing independent shows. Whoa. "Cafe Video Drome," says Leo Kacenjar, media student and head of Centenary Film Society, "is the Film Society's rendition of Friday Night Madness. This is a great opportunity to see cult, extreme and otherwise eclectic cinema of the world. Screenings are the first Friday of every month." Admission is free, and the films are open to the public, though preference in capacity seating is given to Centenary students. "View at your own discretion!" says Kacenjar, a fellow who has grown up part of the Litigious Society. "Movies are meant to be fun, but may be a little extreme at times. Hang on for the ride." Fri, Sept 7, CFS presents "The Host." 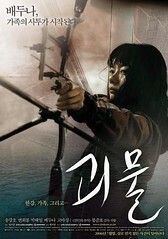 Kacenjar: "This Korean creature flick is a satire, comedy, and horror rolled into one. Moments range from horrific monster violence to slap-stick comedy. Surely this film will rise to cult status." The Mist is a 2007 horror film based on the 1985 novella by Stephen King. The film, written and directed by Frank Darabont, was filmed at StageWorks of Louisiana, says wikipedia. John Grindley, Robinson Film Center, announces, "The trailer for The Mist has hit the web:" the Yahoo preview for The Mist. The Times' Alex Kent says that exteriors were filmed in the atmospheric suburb of Hollywood South called Vivian. While Michael Butterman's lecture on the symphony, to be held in Anderson Auditorium, Huley Music Bldg, centenary College, is aimed at the Shreveport Chamber of Commerce Young Professionals group, I'd crash it in a moment. The young music director is easily one of the most animated, witty and persuasive speakers in the area. And he has proved it in front of a thousand people at a time at Riverview Theater.